Note on the e-text: this Renascence Editions text was transcribed from the 1786 edition of J. Crukshank, Philadelphia, by Judy Boss in Omaha, Nebraska, and is provided by Renascence Editions with her kind permission. Title page is taken from the London 1773 imprint. The table of contents appeared at the end of the first edition. It appears here at the beginning. 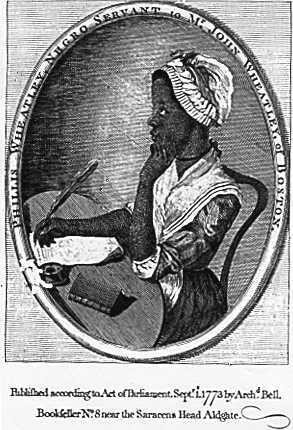 The engraving of Ms. Wheatley was a Frontispiece to the first edition. Footnotes have been shifted to the right margin for improved readability. This edition is in the public domain. Content unique to this presentation is copyright Â© 1998 The University of Oregon. For nonprofit and educational uses only. Send comments and corrections to the Publisher, rbear[at]uoregon.edu. To M Ã† C E N A S.